Solo: A Star Wars Story is yet another side story in the Star Wars franchise after the success of Rouge One. However, this time it tells the story of fan favourite and fanboy self-insert of the franchise: Han Solo. Despite obviously making the money that Disney needed it to, there seemed to be a distinct lack of hype and epic scale of the release of this film, which is strange considering who it’s about. Even the marketing seems downplayed by Disney standards and it seems to be banking on its connection to the franchise to pull through. So the question is posed: is there any good here? Does it need to exist? How does it rank against the franchises other installments? For as much as the complaints regarding the lack of need for a Han Solo movie, there is a fair amount of good choices to be found. For example, Donald Glover is a fantastic choice for Lando Calrissian and he deserves at least double the screen time that he has. His charisma oozes through the frame in every scene he’s in and it’s only once he appears that the story begins to pick up. The whole first act of the film really begins to drag but once he shows up, the new team finally begins to do what they set out to after failing the first time. He also has a droid co-pilot (Phoebe Waller-Bridge) who is also a fun character, being a snarky, rebellious activist for equal rights for droids and most of her comedy comes from her snark with the other characters instead of being a joke herself like most of the other droids. Woody Harrelson is also a fun as Han Solo’s mentor/partner, although I always wonder if seeing him in these movies comes from a determination for him to be in every single sci-fi franchise war film ever. There is a fair amount of good wholesome fun, particularly in the last third with betrayals, backstabbing, double-crossing and character motivations changing and revealing new things. For example, Han’s relationship with his girlfriend throughout the film is rife with back-and-forth of what will come of it (as we all know from the future films that the relationship is doomed). There’s a surprise cameo from an unexpected iconic villain and the ending is one of the few parts to actually have some weight. However, most of this film is extremely light on story and character and while it is showing the past of Ham Solo, it does so in a way that doesn’t tell us a lot more about him and unfortunately a lot of that comes from the central performance. There are also points where the story drags and almost loses focus and it becomes a chore to sit through, even in parts that should be exciting. Even as a smaller story, the plot is so thin that what should be exciting, fun action becomes frustrating when they can’t just get from point A to point B already. Sadly, Alden Ehrenreich in the titular role feels just miscast here. Despite clearly trying his best, he just doesn’t capture the attitude of Harrison Ford’s iconic portrayal of Han as being both the cool guy and a complete disaster who doesn’t know what the hell he’s doing. The understanding is that this portrayal of Han is as a more wide-eyed, excitable young thief before he became so jaded in A New Hope but even that feels distinctly off in this performance. It’s not entirely his fault; some of the dialogue comes from writers desperately trying to capture what they think Harrison Ford would have said but Ehrenreich’s performance doesn’t enhance any of the material. Whatever interpretation of the character they’re going for, it just feels unconvincing and almost constantly reminds you that you’re watching an actor and not a character. 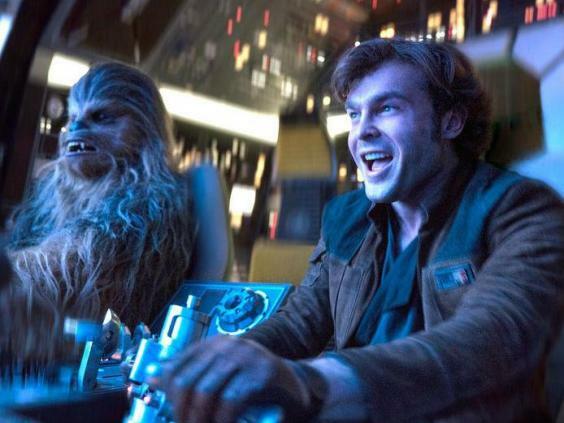 Despite the moments mentioned earlier, the biggest downfall of Solo: A Star Wars Story is how completely inconsequential it is as a film and not just as a Star Wars film. While the “A long time ago, in a galaxy far, far away” title card is shown, we get no iconic Star Wars text scrawl explaining the setting and building the hype. Instead, we get a few screenshots of exposition and then the film just starts. It almost feels like an admission from the creators that they know you don’t really need to watch this. And that’s the biggest tragedy of the film; for all it’s fun and occasional tense moments, there’s absolutely no grand scale to the presentation. Rogue One, for all its faults, took its smaller story and gave some weight to the build-up of what was to come in in the later films and did have some incredibly memorable moments (especially the scene with Darth Vadar). Star Wars, even when it’s bad or divisive, is almost always memorable and the biggest tragedy of Solo is how much it doesn’t square up to that. The bland moments don’t come close to the enjoyably bad cringe-fest of Phantom Menace or Attack of the Clones while the fun moments still can’t compete with the fun and excitement of defeating the empire in Return of the Jedi. On top of that, there’s absolutely no risk factor in the decision making and it’s as safe as film-making can possibly get. Say what you want about The Last Jedi (that request is rhetorical; I’ve heard far too damn much about what people have to say about The Last Jedi) but it and The Empire Strikes back took some of the most daring risks in the franchise and succeeded in fuelling fan discussions for years. There’s so little of the spirit and mythology of Star Wars in Solo that it feels like any sci-fi space universe (the Force isn’t even mentioned a single time). So, where does that leave Solo: A Star Wars Story? I’d say only see if you’re a die-hard Stars Wars fan or if you or your kids just want a cute space adventure that doesn’t require too much thinking. Aside from that though, I sadly can’t say this instalment of the franchise will leave its mark on the galaxy.